Two Aviators Plunge to Death. Transcribed by Bob Davis - 11-17-07 Two young aviators, William R. Badger of Pittsburg and St. Croix Johnstone of Chicago lost their lives at the international aviation meet at Chicago, Tuesday. In dying, both revealed the frality of the craft in which two more aviators were curving and gliding about in the air with scarcely a pause for the deaths of their contemporaries. Death in both cases was due to unexpected accidents, probably the result of unsuspected defects in the mechanism of the machines and was in no way caused by the carelessness or lack of responsibility of the drivers. 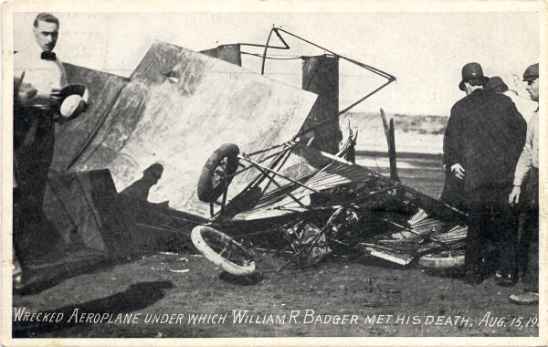 Badger, a wealthy youth, careened to his death in a pit in aviation field. There had been a flaw in one of the wings of the propeller of the Baldwin machine he drove. Centrifical force broke the propeller, upset the delicate equilibrium of the machine and Badger dashed 100 feet to the bottom of the pit, his neck being broken. Johnstone fell 500 feet under his engine and was drowned as a result an equally unsuspected defect. Caught under the heavy engine in the Moisant monoplane, he was carried deep into Lake Michigan and his body was not brought to the surface until an hour later. Badger lived for three-quarters of an hour after he had been extracted from the remains of his engine. He did not recover consciousness and died almost at once after he had reached a hospital. His death was the first serious accident of the meet although 35 flyers have dipped and glided in Chicago for three days, and experts say several similar accidents have been narrowly averted. Badger flew as he formerly drove racing automobiles, purely as an amateur. He was the stepson of John Goettman of Pittsburg and was 25 years old. He possessed an independent fortune and gratified a well developed speed mania. 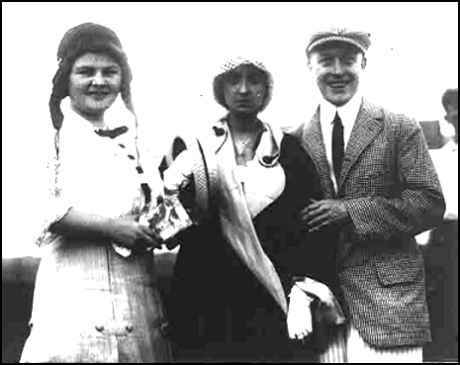 In the early days of automobiles he was among the first to make amateur records at Daytona and Palm Beach. He was an intimate of Louis Strang, the automobile driver who died beneath the engine of an automobile. Through Strang, Badger became interested in aeroplanes and both became amateur aviators. The meet here, which began last Sunday was Badger's first public appearance. The big mechanical sign board after his death recorded that he had flown up Tuesday, just two hours, 13 minutes and 19 seconds. The flight that ended his life had earned him possibly an hour more when he fell. He dropped just in front of the center of the grandstands and thousands of spectators were within a few hundred yards of the accident. Hundreds leaped the fence, fought past the line of police and into the pit where the wrecked aeroplane lay. There was a near-panic in the field and numerous heads were cracked by police clubs. 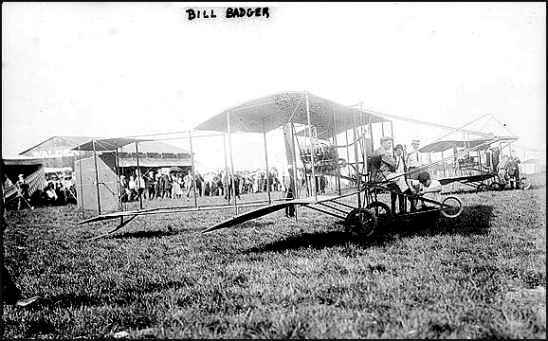 The injury was announced through the megaphone and five minutes later while Badger was on his way to a hospital, attention and interest had reverted to the men still flying, many of whom offered possibilities of similar thrills and possible fatalities. Through his friendship with Strang, Badger met Captain Thomas Baldwin. He bought an aeroplane outright and received his flying lessons at Mineola, N.Y. In June, he made a successful flight and was granted a pilot's license. Following this he made further flights and his aviation enthusiasm grew. He practiced with J. C. (Bud) Mars and decided to enter the meet with Mars, although his entry was distinct from the entries controlled by Captain Baldwin. He had planned to finish the meet here and then take the train to Wheeling, whence he wanted to make a triumphal flight in to his home, Pittsburg. He was entered at a coming meet in Boston. Captain Baldwin after the accident at once withdrew all his machines from the meet. Badger's mother died recently and so far as is known his step-father, Mr. Goettman, is his only survivor. Johnstone's accident was due, according to expert aviators, to a similar unsuspected flaw in the mechanism of his aeroplane. Just what it was probably will never be known as the engine is deep in the lake, and the wood and canvas of the plane were scattered by the tremendous impact with the surface of the water. Johnstone's actual fall was witnessed by his young wife, although it was not until a half hour later, that she informed of his death. As the monoplane faltered in mid-air, then crashed downward to the surface of the lake, the young aviator's wife, who had been following his flight closely, grasped a mechanic's arm and exclaimed in fear: "Oh! Oh! Pity, he's falling. My boy will be killed." Wives of half a dozen aviators whose attention had been diverted on the plunging machine that was to carry the second victim of the day to his death, rushed to Mrs. Johnstone's aide and as the machine hurled into the lake and out of sight, they tried to assure her that Johnstone would suffer nothing worse than a ducking. "Possibly not!" exclaimed the fear-stricken wife, "but you could see the way the machine plunged, that St. Croix had completely lost control of it. Oh! Why don't they hurry up and get him out. Some of you men must take me to a boat so I can get out and help him." By this time a half dozen mechanics and hangar attaches had rushed up to the group. They whispered to the women surrounding Mrs. Johnstone that her husband had been picked out of the lake unharmed, that a boat was bringing him ashore and that he would join her in the hotel immediately. Reassured by this information which had been deliberately invented to calm the fears of the aviator's wife, she went back to her hotel and hurriedly laid out dry apparel for her husband. For half an hour or more, she waited, and then a member of the Johnstone family took her word of the aviator's death. The young wife was prostrated. Twenty minutes before the break in the monoplane's warping strand, the accident that sent young Johnstone careening into the lake, his father, Dr. Stuart Johnstone, and Mrs. Johnstone stood in front of the Moisant hangar with St. Croix's wife, watching the young aviator in what they thought would be the last few minutes of the flight that he had started from the field at 3.15 o'clock and had sufficient petrol to keep him in the air until 6.30. 'No, I must go," rejoined the doctor. "It don't look as though St. Croix would lose his life today, he seems to be flying too smoothly for a mishap. He's been up two hours now." Then he and Mrs. Johnstone turned away, leaving the young wife with her eyes still riveted on the soaring monoplane. Less than 20 minutes later, the wings of the machine crumpled like paper and the machine hurtled into the lake, its heavy engine and tangled wires dragging its pilot to his death. 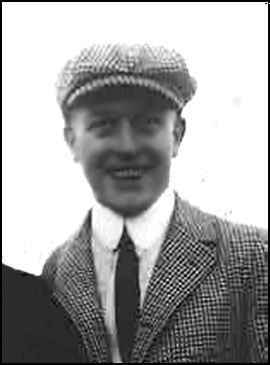 Like Badger, Johnstone flew as an amateur. His father, Dr. Stuart Johnstone, a practicing physician, however, had refused to buy him an aeroplane. Johnstone, who was but 26 years old, and ambitious, started to build one and went to France, where he entered the Drexel school of aviation. He then went to the Bleriot school and learned to fly. Then Johnstone's father again refused to buy him an aeroplane, and his answer, found today in a letter written by father to his son, almost a year ago seemed to foretell the fatal accident. 'My conscience will not permit me to contribute to your certain death by providing you with a flying machine," he wrote. "I cannot buy you one, St. Croix." After learning to fly in France, Johnstone went to Havana, where he was the first to fly around the wreck of the battleship Maine. He returned to the United States late in the spring and was immediately engaged by Alfred Moissant, and has since been with the group of French aviators. After his return from Havana, Johnstone established the American record. During a flying exhibition at Mineola on Aug. 5, he remained in the air four hours, one minute and 59 seconds. 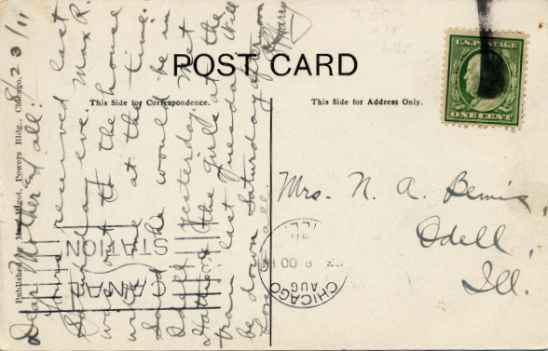 I too have the postcard about William Badger meeting his death. Have you been able to find out anything about him? His lineage? My Badger family comes from Michigan and Chicago so perhaps we're related. Editor's Note: If you can help Jeff with his search for more information, please contact him by email using my address. I will be happy to forward your message to him. Thank you. 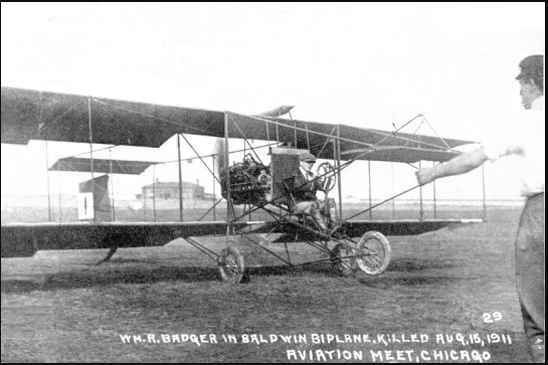 William R. Badger was killed at the 1911 Chicago International Aviation Meet, on August 15th, in a Baldwin biplane.